This healthy version of the classic Tuna Melt is so easy to make at home! With a side of chips and a crunchy dill pickle, it’s a frequent Friday night meal for my family! I never used to be a big fan of tuna, especially as a child. But one day I decided to be adventurous and try a Tuna Melt at a restaurant… I was sold! It goes to show ya, if you add melted cheese to something, it’s usually pretty darn good! Now that I had a new favorite sandwich, I started making it at home… healthier! 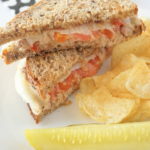 I lighten up the calories by using just a “little” bit of mayo, a thin slice of cheese and thin sliced high-fiber bread. I don’t even get fancy with my tuna mixture… no extra add-ins, just a splash of lemon juice and a dash of pepper! Check out my entire list of “10 Dinner Favorites”! I pick one meal a week from this list, which helps a great deal with Meal Planning! Many of these ingredients are staples that you probably already have on hand in your kitchen, so it’s an easy sandwich to make on the fly at any time! Wild Tuna: Use a quality light, wild tuna. I prefer to use Wild Planet’s Skipjack Wild Tuna, which I buy by the case on Amazon (affiliate link). Spending a little extra for a quality tuna is worth it because it tastes so much better and is better for the planet! Mayonnaise: Olive oil and Avocado Oil Mayo are both great choices. Lemon (optional): I like to squeeze 1/2 a lemon into 2 cans of tuna for an extra splash of fresh flavor. Sliced Bread: I’m a huge fan of Dave’s Killer Bread Thin-Sliced. It holds up well with the filling and adds a boost of nutrition. Experiment with all types of bread! Sliced Deli Cheese: A quality slice of cheese that melts well is key! 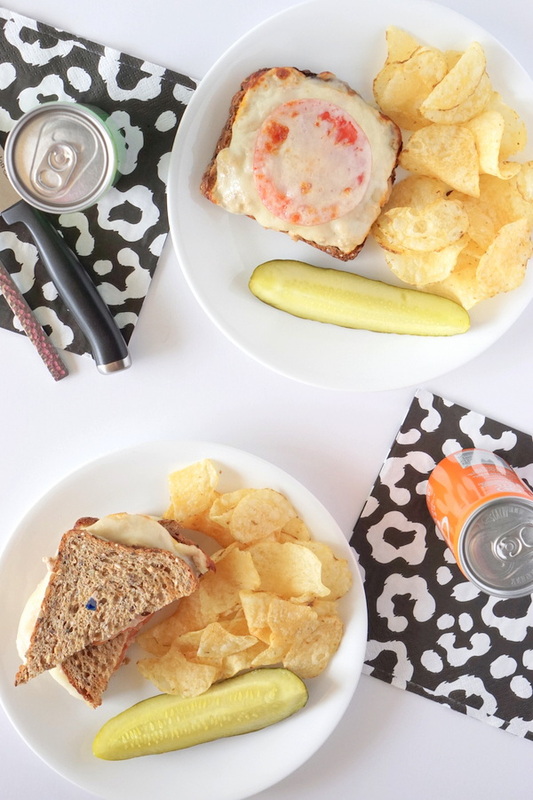 I chose Muenster because it’s neutral in flavor and pairs well with the tuna. Experiment with all types of cheese! 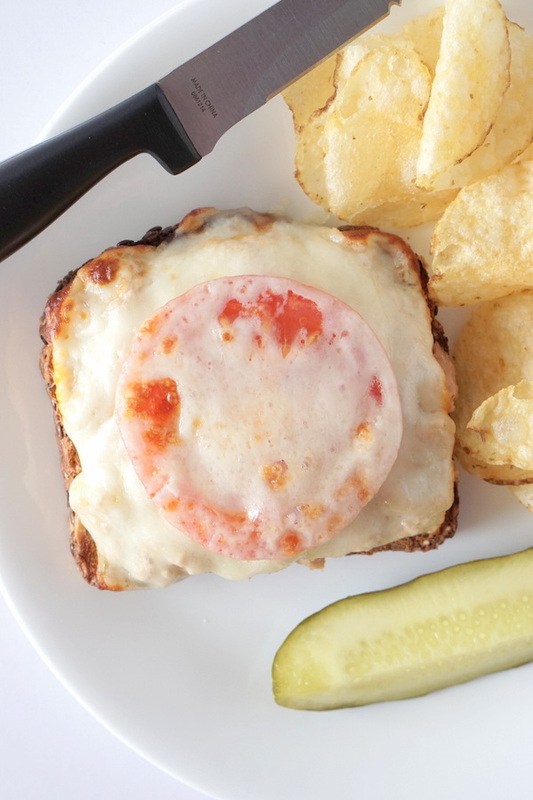 Tomato: I guess a slice of tomato is really not the norm for a Tuna Melt. But why not, it adds a little extra Vitamin C and flavor. Potato Chips: I know potato chips are not the healthiest, but I always try to choose a healthier version, like Kettle Brand cooked in Avocado Oil. They’re so crunchy and satisfying. Although, baby carrots, celery sticks and/or bell pepper are crunchy too… maybe next time! Kosher Dill Pickle Spears: A perfect side to any sandwich! I prefer to buy my pickles from the refrigerated section because they have more probiotic benefits than those sitting on shelves. Everyone in the family will enjoy this yummy sandwich! My daughter skips the tomato, but that’s easy to modify! The guys, on the other hand are not picky. To cut a few extra calories, I prefer to enjoy my Tuna Melt Open-Faced. To be proper, sure, use a fork and knife to eat it. But, at home, I just pick it up and chow down! Everything stays in place because of the melted cheese. This light meal is perfect for a quick, effortless Friday night dinner! We’ll usually enjoy a small 8.4 ounce can of Izze (affiliate link), which is a treat and the closest we come to soda. 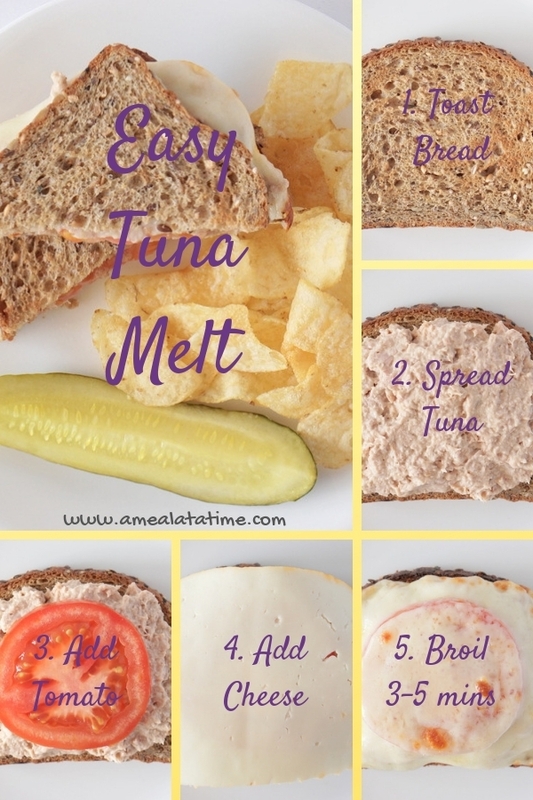 Go ahead and make this yummy Tuna Melt at home any day of the week for lunch or dinner and enjoy! 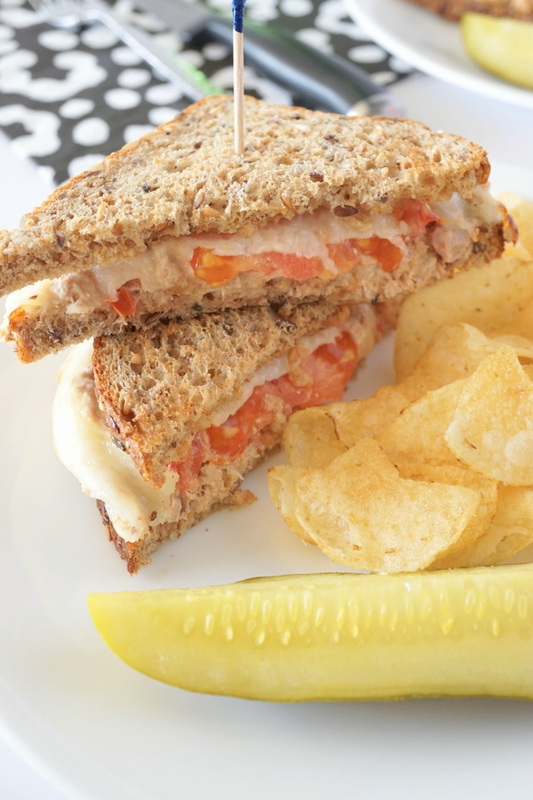 This healthy version of the classic Tuna Melt is so easy to make at home! With a side of chips and a crunchy dill pickle, it’s perfect for lunch or dinner. Meanwhile, in a small bowl mix tuna and mayonnaise, mashing large chunks of tuna, until desired consistency. Add lemon juice and season to taste with pepper; stir. Preheat broiler and line a large baking pan with tinfoil or parchment paper. Place bottom slices of toast on pan and spoon tuna mixture on top, distributing evenly. Top with a slice of tomato and a slice of cheese. Place pan in oven 5 inches from broiler and broil 3-5 minutes or until cheese begins to melt and brown slightly. Watch carefully. Remove from oven. Top each sandwich with 2nd slice of toast and press down lightly. Omit top slice of toast for open-face version. Serve immediately. *On The Side: Serve with potato chips and a refrigerated dill pickle spear. For a healthier side, serve with carrot sticks, celery sticks, etc. This post contains Amazon affiliate links. I make a few pennies if you click on one of these links and make a purchase (at no extra cost to you). Thanks for your support!